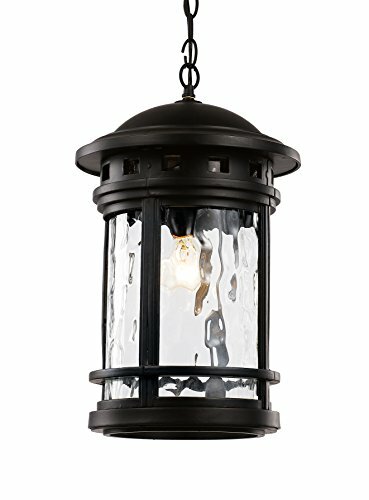 Trans Globe Lighting 40376 BK Outdoor Boardwalk 19" Hanging Lantern, Black | Fountain City Art Ctr. The Boardwalk Collection brings suspended decor to an outdoor area with a hanging lantern. The Boardwalk 19" Hanging Lantern brings unobtrusive lighting to any outdoor living area while boasting an eye-catching design. This fixture blends a durable metal frame with Clear Water Glass, providing a unique combination of Nautical design. The glass adds beautiful, soft reflections to the areas it shines on. Bulb Type: Incandescent. For Outdoor use. Has adjustable dimensions. Chain length: 36 inches. This item is ok for vaulted ceilings. Type of glass is Water. The materials used are: Metal, Glass, Electrical. The Finish is Black. Bulb base is E26. The bulb is not included. This item is dimmable. The bulb shape is A19. Wet listed. Warranty details: One year limited Warranty.